One of the first things people learn during TCU’s active shooter training is to lock the door to help protect themselves against an attacker. 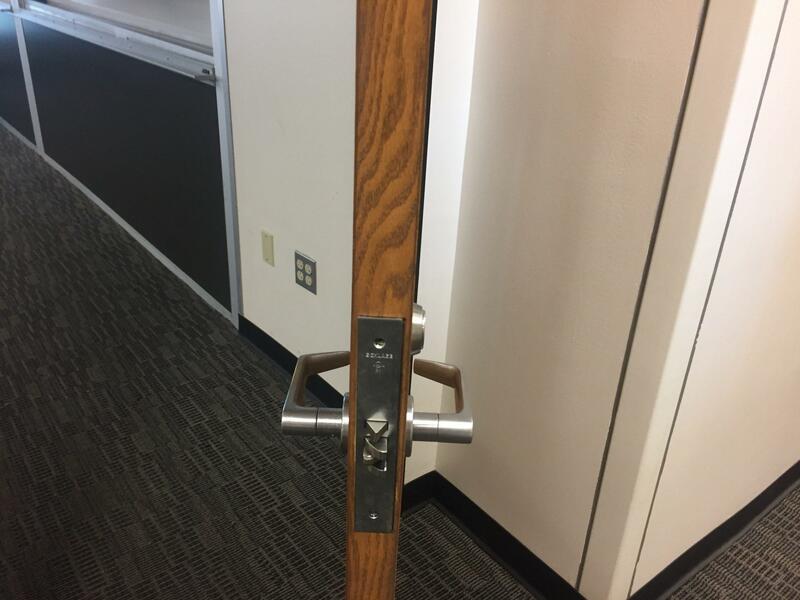 But after Tuesday morning’s lockdown, TCU360 surveyed classrooms across campus and found that many doors could not be manually locked from the inside. 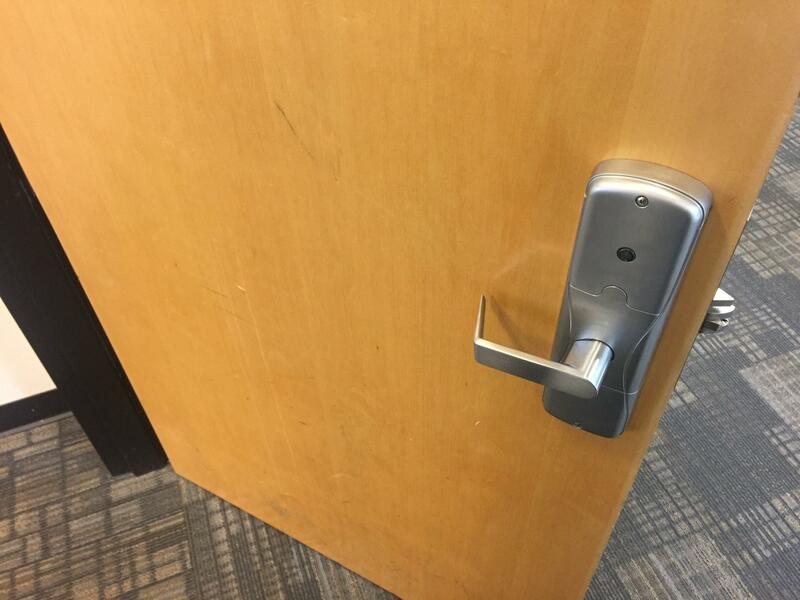 Assistant Vice Chancellor for Facilities Chris Honkomp said that most classrooms on campus have the automatic locks that can be remotely locked. 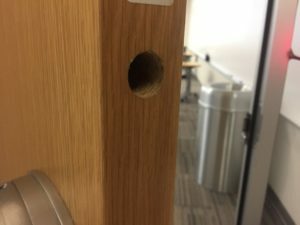 In some classrooms, there’s a hole in the door where the deadbolt used to be. “Anything new we’ve built has got the card swipe,” Honkomp said. Honkomp said the decision to implement more key card swipes instead of manual locks was made with safety in mind. Faculty Senate Chair Ted Legatski also sees benefits to the automatic lock system. “While not a complete answer to every potential situation, this upgrade over the past few years represents a significant investment in improving the security of all on campus should another emergency lockdown occur,” Legatski said. 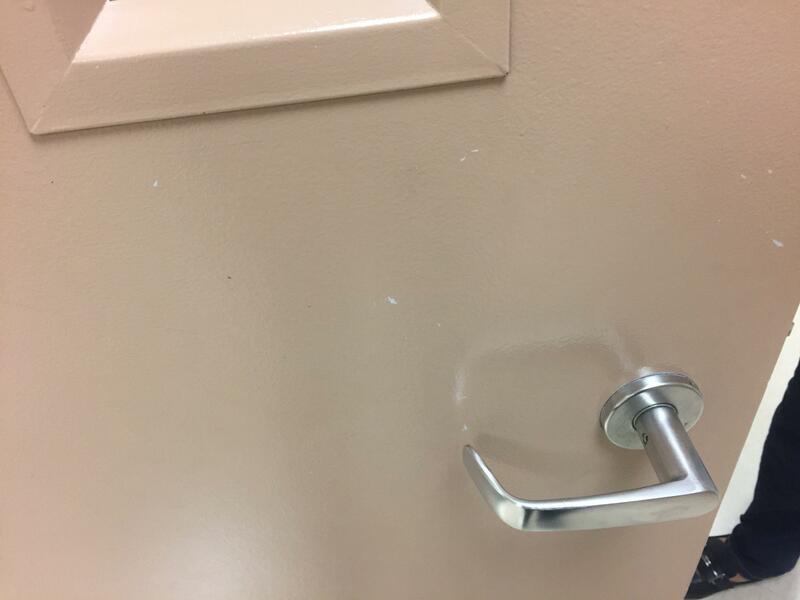 Legatski added that while he has previously heard worries from faculty, staff and students about the inability to manually lock doors, he has not heard any recently. 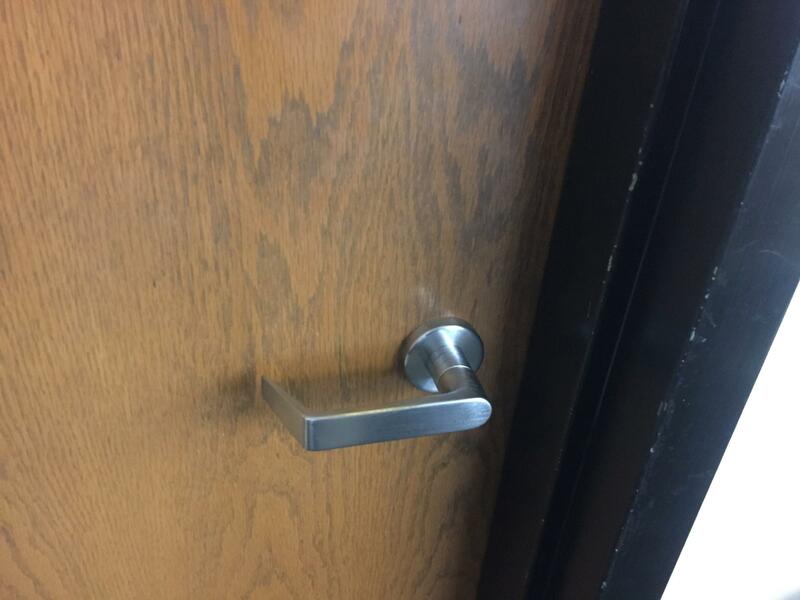 But TCU police said the inability to manually lock a classroom instantly is a concern. “We want everyone to be able to take action immediately,” Assistant Chief of Police Robert Rangel said. 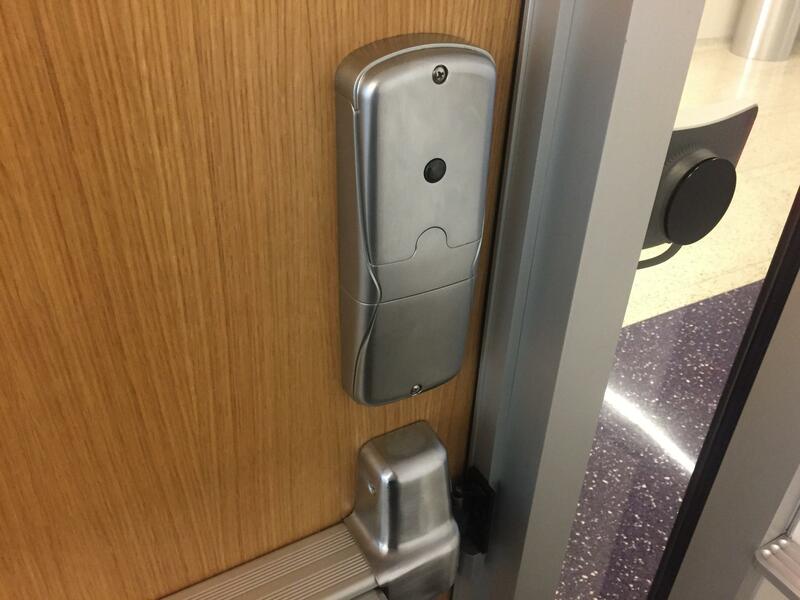 Rangel said the department plans to recommend that TCU buy devices that allow people to manually lock the door. These types of devices include sleeves that can go over the joint of the door to prevent it from opening and rods that brace the door shut. Honkomp said discussions about not being able to lock the door manually in the case of an active shooter never came up in the planning process. Instead, he said, there are safety concerns with manual locks. Rangel said the TCU Police have the authority and the ability to automatically lock down the classrooms across campus, an action that he said takes place within two minutes of receiving the report of an incident. Although this automatic locking of the doors can cause problems since the police lock overrides the use of an ID to get in the building. This is something associate professor Krista Scott said she is worried about in Ed Landreth Hall. He said the department is working on an assessment of what rooms across campus would need this kind of device. A similar assessment of security cameras across campus took about six months Rangel said. “In the future, the police department will be involved with architects when we’re designing buildings to incorporate some of the protocols,” Rangel said. Legatski said he would like to see emergency panic buttons installed in the rooms that offer direct communication to TCU police. 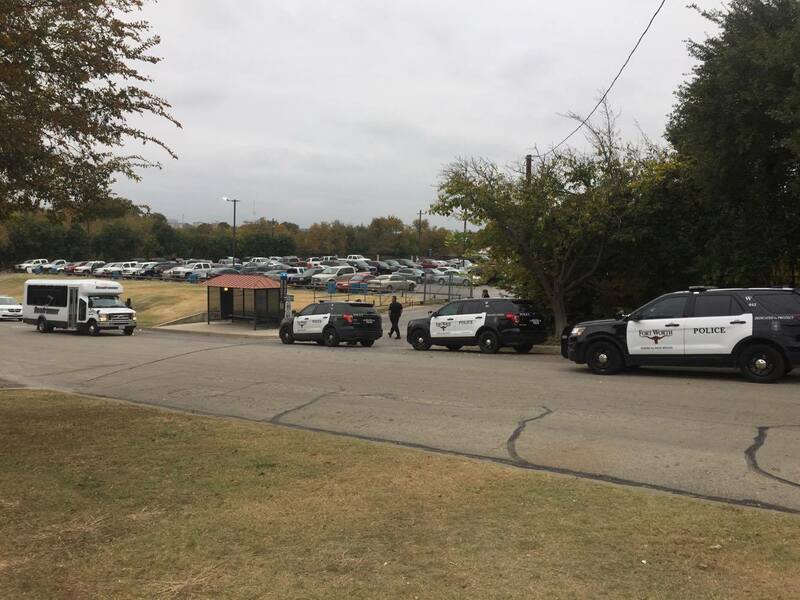 During Tuesday’s lockdown, there were multiple reports of problems at the University Recreation Center. A REC employee, who asked to remain anonymous because he wasn’t authorized to comment, said none of the outer doors to the building ever locked. At a press conference Tuesday morning, Assistant Vice Chancellor for Public Safety Adrian Andrews said he was at the REC working out and was pleased with the response of employees. Communication Studies instructor Michael Putnam was also working out in the REC when he heard the alarms sounded. Putnam added that Tuesday’s incident could help provide information on how to better the lockdown system for the future. Rangel said the university is already making changes based on reports from Tuesday. For example, he said, some of the speakers that sounded the alert couldn’t be heard in some buildings. Those speakers have been identified and the physical plant is being sent out to fix any problems in them, he said. Legatski said he was impressed with the “extremely professional and competent” TCU police and added that the campus is very safe one by almost any measure, in part thanks to the commitment of TCU administration to make it that way. Elizabeth Campbell is executive editor of TCU 360 and a senior journalism and political science double major. When not in the newsroom, she's thinking about the news while probably watching TCU football or being a history nerd. Send her a tip if you have a story to share!